Every Summer, Baltimore hosts Artscape, an art festival that fills up a 2.5 mile loop of city streets with art installations, exhibits, vendors, and interactive activities. “I was able to identify at least one or two people in every block that in some way used our makerspace to produce some element of the festival,” said April Lewis, the membership manager at Open Works, as she described one of her favorite moments from Open Works’ first year of operation. Open Works Baltimore was the subject of a series of articles that we ran under the header of “Made in Baltimore.” These articles were written by Will Holman, the Executive Director at Open Works, and detailed the process of starting this makerspace from the ground up. We’re revisiting Open Works to see how things fared during their first year of operation and to take a closer look at Baltimore, MD, a city that seems to be in the midst of its own makerspace Renaissance. “So far, we’ve had a perfect safety record (knock on wood)!” Holman says. To hear it from him this is one of the least of Open Works successes. Over the past year the makerspace has grown to a diverse group of 200 members, 500 people have been trained in their safety class, and over 1,000 youth have participated either on-site in one of their programs or off-site with the Open Works Mobile program. 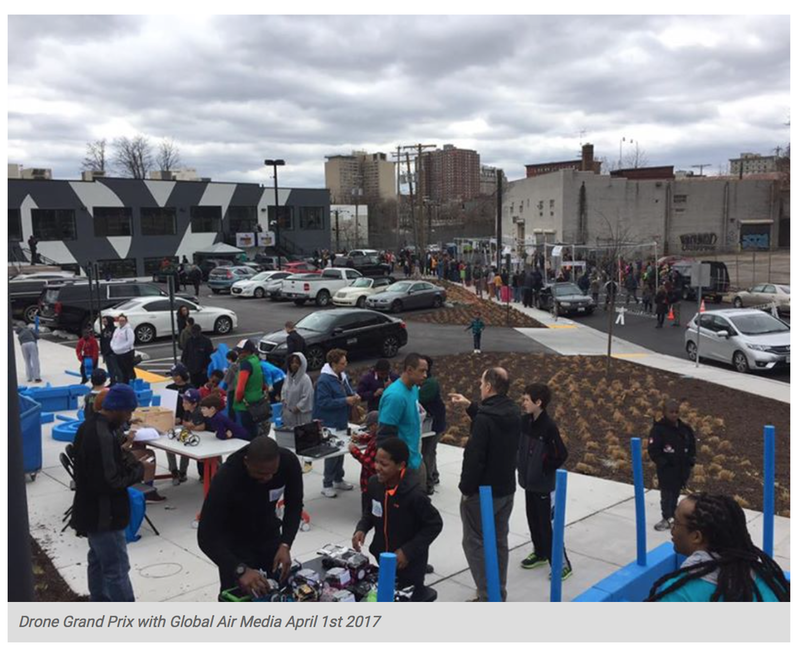 They hosted Baltimore’s first drone race, launched the EnterpRISE Venture competition, and even partnered with neighborhood residents to start a farmer’s market in their parking lot. Early on I witnessed community members (young and old) uncertain of what they could accomplish at Open Works, [who] over a short period of time developed an understanding of the space and given the opportunity to do and to make; which I believe is a direct correlation to the sincere nature of the staff to be welcoming and supportive. It’s not a bad place to be after one year. Even so, there were still challenges. They had to ditch the custom software they were building out for member services and ended up using MindBody, software originally designed for managing yoga studios, instead. Open Works also didn’t have a process in place for resolving disputes between members until their first conflict came up. “It all turned out ok, but in retrospect those good governance things are important to get in place early and set expectations,” Holman explains. It takes hard work to insure that a space remains truly inclusive and considerate of everyone–all races, genders and sexual orientations, socioeconomic demographics, ages, and abilities. I’d say that it takes work to remain conscientious and intentional about where we are doing outreach, who we are engaging in our space, and that we are doing enough to create opportunities for meaningful engagement for everyone. Open Works was not created in a vacuum, and there is something that can be said about the factors at play in Baltimore that are helping support makerspaces around the city. If you use the term broadly, Baltimore has at least 14 makerspaces. They run the gamut from niche shared resource facilities like the Baltimore Jewelry Center and Clayworks, to more general purpose hackerspaces like Baltimore Node and the Foundery. Hackerspaces first started appearing around Baltimore around 2009, but in the last five years or so the number of makerspaces has been increasing and older organizations have been able to move into larger spaces. Piper Watson is the co-founder and director of operations at Station North Tool Library, which opened in April 2013 and often partners with Open Works (which is literally around the corner). When I ask her about the things that were going on in Baltimore around the time the tool library was founded, she describes a community with a lot of character, a very active arts scene, several colleges, and a very involved and passionate community association. That said, the neighborhood had seen better days. Much of the neighborhood was vacant or had fallen into disrepair and many people didn’t have the means or the skills to make repairs on their own. There was widespread support at the city and state level for programs and spaces that supported the community, encouraged work force development, or focused on Baltimore youth, as well as philanthropic institutions, like the Robert W. Deutsch Foundation, willing to invest in those programs. Makerspaces like the Station North Tool Library and Open Works meet a lot of these needs. With so many makerspaces in one city, it might seem like overlap and toe-stepping could become a problem. Instead, these separate organizations frequently collaborate with one another. Technical.ly Baltimore and the Maryland Institute College of Arts are both working on initiatives to network and promote these local makerspaces. In the case of Open Works, this spirit of collaboration started long before the space even opened. During its planning stages, Open Works made a conscious decision to avoid replicating other facilities for the most part — staying away from clay and letterpress, for example — because there were already facilities for those in Baltimore. Holman also reached out to other makerspaces to plan collaborative classes and programming. Many instructors from the Station North Tool Library also teach classes at Open Works. Working with other makerspaces and groups in Baltimore remains an ongoing interest at Open Works. “Right now we are working to prototype and test a safety curriculum that would work as a transferable safety credential between spaces, which would really lower the barriers for folks to get into and move between our spaces,” Holman says. In the case of Station North Tool Library, their demographic tends to be complete beginners. “The number one question that people ask when they come in the door (literally, not joking) is “How do I put a bit in a drill?” And what that tells us is that [for] a lot of people, these skills aren’t passed down anymore. So if you don’t know how to do that, you’re probably not going to walk into a big, shiny, new makerspace and want to learn how to use the laser cutter,” Watson says. Watson sees spaces like tool libraries as important jumping off points. A person might come in just looking to solve a single problem, but once they have access to the tools and knowledge, it opens up new possibilities. In this way, the tool library is acting as a pipeline that trains people enough to get them to a point where they might even consider joining a makerspace. This helps other makerspaces in the long run, and builds a foundation for future membership within the community. All of these trends [in manufacturing] are driving huge productivity gains without the type of employment gains we’ve seen in the past. This is the reality of modern manufacturing. Where I think the growth will be is not in re-shoring something like making iPhones; it’s going to be in higher value-added, tech-enabled, or craft/artisanal products made with distributed models. It’s still too early to say if that’s what the long term impact of Baltimore’s makerspace renaissance will be, but people are already using Open Works and other makerspaces in order to make a supplemental income, pick up job skills, or jump start new businesses. I’m seeing the demand both from the employers who are saying they need more skilled people they can hire from, as well as from this pool of applicants who are saying this is a skill I want to learn, this is the kind of job I want to have. Cook has already partnered with Open Works and local soft goods manufacturers to create an industrial sewing training program, and hopes to do similar projects in the future. Apart from that, both he and Holman have noted that the Open Works is being used by people who are self-employed, selling their goods on an online marketplace like Etsy, using the tools for one-off work projects, or creating custom items for clients. “With pretty minimal resources (say a makerspace and an internet connection) they can start a business,” Cook says. Typically, once a business starts having employees, they move to their own space. Already, there’s been an example of this at Open Works. MF Fire, a company started by two University of Maryland graduates, have been using Open Works “since nearly the beginning,” according to Holman. Now that they have three employees, they are moving from the makerspace into their own space. One of the most unique things about our makerspace is that we are truly community centric, not just with our member community but with our neighbors as well. We’ve taken some non-traditional approaches to growing our community, like having a coffee shop in our lobby with couches and house-made board games, a farmer’s market in our parking lot on the weekends, a deck with adirondack chairs for lounging, community association meetings for our surrounding neighborhoods, and events in our public spaces with mission aligned organizations. Take ownership of the uniqueness of your make space culture. Show your commitment to inclusivity in your mission, your hiring practices, your program development, professional development, your policies and customer service. Be who you say you are. If you are not willing to be it, do not say it.